Welcome back for Day 2 of the Fresh Squeezed Stamps August release! Another new installment to Subway Series! My card is thinner to accentuate the height of the sentiment. This fun Subway Series stamp was embossed in Grapefruit Zing embossing powder and adhered to the card with foam tape. Love the addition of the glitter tape! The color palette is gorgeous and I love how the strip of glitter takes it up a notch! So fun, so fun, so fun! What's not to love about cocktails, shoes, shopping and girls night out! SO PRETTY Tracey! I like the bit of glitz and glam you added with the sparkly strip! This is fabulous--and I am in for the girls night out for sure. Love that strip of glitter tape. LOVE the glitter tape! Fab card! I'm with Joyce, so lets plan a girls night out! This card is just beautiful and I love the glitter tape along with the embossed sentiment, fabulous! 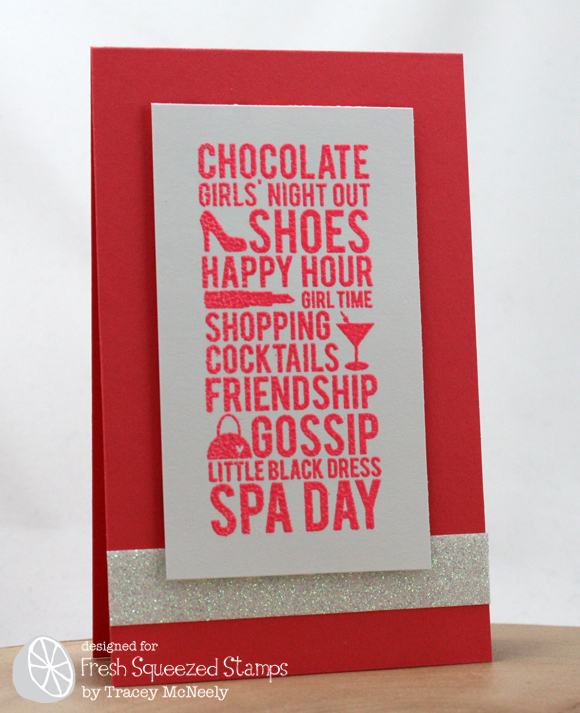 Love this card Tracey...so ready for a girl's night out! Well this is a fun card! I love these subway sentiments, especially when they are embossed! And the glitter layer adds just the right amount of bling! What a great image, and I just adore the way you've grounded it with that yummy, glitter strip! Hey, and thanks so much for leaving me so much love, between my own blog and the Wplus9 Design Blog, lately. It means so much to me. Big hugs! this is awesome...thrilled to see FSS come out with a new Subway collection! I love the embossing and the bling. great card Tracey...so fun!! I'm in!